Panasonic has unveiled a wide range of home cinema rigs, including six new DVD set-ups and some impressive looking Blu-ray systems. The Japanese manufacturer has long been an advocate of a connected home, but its raft of new home-cinema rigs continue the trend and, in some cases, get rid of the wires. First up it the SC-ZT1 which is a wireless system that has just two speakers as 2.1 standard, but can have additional wireless speakers added. The higher-end Blu-ray systems SC-BTX70, SC-BT205 and the SC-BT200 are all internet enabled – allowing you to take advantage of the host of useless features, such as interactive quizzes, currently offered by BD-Live. Plus, more usefully, you can view web content from the likes of YouTube and Picasa. Of the six DVD home-cinema systems, the SC-PT870 and SC PT570 models boast 1,000 watt output courtesy of a dual-chamber Kelton subwoofer while SC-PT870, SC-PT570, SC-PT475 and SC-PT470 all benefit from the Bamboo Cone speakers. 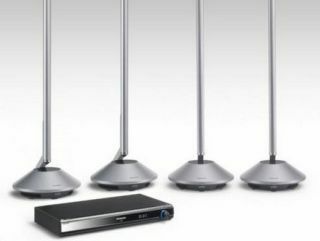 Panasonic has also launched six new Viera-link enabled DVD home cinema systems, four of which (SC-PT870, SC-PT570, SC-PT475 and SC-PT470) inherit the Bamboo Cone speaker that was so popular in previous models. For iPod/iPhone users, the SC-PT870, SC-PT570, SC-PT475 and SC-PT470 all have an integrated dock.